Oni Logan on vocals and George Lynch (Dokken) on guitars, it's a proper Lynch Mob and all songs produced and written by the duo. Add to this Jeff Pilson (Dokken, Dio, Foreigner) on bass and drummer, Brian Tichy (Whitesnake, Billy Idol, Slash, etc. ), and you're all set for a pretty cool and groovy affair. It's been 25 years since Wicked Sensation and you're not supposed to expect another record by now? 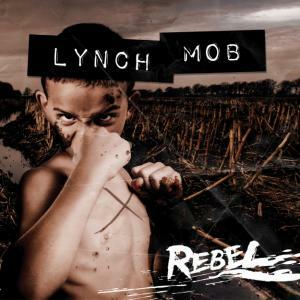 Rebel is however the best Lynch effort for quite some time and it's definitely the grower album. Nope. It's not as easy listening as the debut, but there's a killer groove, plenty of riffing, excellent rhythm section, and Oni's soaring voice on top of everything as the icing on the cake. That man can still belt out all the high notes and the vocals are what keeps this record going to 4R's and then some. I have this love hate relationship to Lynch ever since he opened up his mouth only to bad talk the eighties (not to mention burning the Dokken past). However, I can still set this aside and appreciate Rebel as good music is always good music, and there's too many weirdos out there anyhow (look who's talking). Do however not expect this to be all catchy and Wicked Sensation as nuthin could be further from the truth. It's slightly darker, heavier, groovier, but with just enough of flashy moves to keep the rock n roll going on at eleven. For instance, take Pinetree Avenue or Dirty Money as the perfect examples of something that would also fit a certain King's X singer perfectly. Did you say KXM? Great production, smoking guitar solos, what's there not to like? Turn it up, sucker!